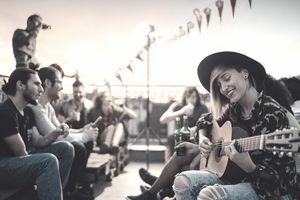 Touring is expensive business, so musicians and labels frequently turn to tour sponsors and concert sponsorship opportunities to help them foot the bill. Competition is, of course, intense, and sponsors will, of course, want something in return for their cash. If you're planning a strictly local event, approach a local business to make your pitch. If you're looking for help on a domestic tour, you need a sponsor who can benefit from being seen around the country - in that case, think regional or national business. The amount of money you need also makes a difference. Certainly asking the local bakery to sponsor your gig to the tune of $2 million isn't likely to get you more than a babka! Know exactly how much money you need and why - and the answer is not, "as much as possible." Formulate a budget for your concert or tour, figure out exactly how much money you need and determine what you need it for. Not only is this process instructive, it will enable you to talk knowledgeably about the financials of your project when convincing sponsors to take a chance on your event. Keep in mind that this exchange isn't all about someone giving you money. You are offering a branding opportunity, so spend some time analyzing the reasons why potential sponsors should get on board with you. What kind of advertising and branding can you offer? Signage on the stage? The company's name all of the show promotional materials ("Presented by...")? Handing out coupons or samples to the audiences? Come ready to discuss these details and be prepared to make your case. Be ready to negotiate and know your limitations. If the company wants to pick the opening act, make a presentation on stage or use your music in their advertising in exchange for their sponsorship, for instance, are you willing to accept those terms? Know what is on and off the table before you make you make your pitch. Before you approach your potential sponsors, do your homework and determine the right point of contact. Depending on the business, you might find this task is easier said than done. Large companies, particularly alcoholic beverage businesses, for examples, are approached frequently, so you will likely find specific instructions for making a sponsorship bid on their website. Follow their procedures, even if you feel like their rules restrict the way you envision making your pitch. These rules are in place to help the company effectively deal with requests, and if you don't stick to them, your request will likely be destined for rejection. With smaller companies, start with the PR and marketing department. For very small, local businesses without designated departments, start with the owner or manager. While sponsorship might be old hat to some large companies, the local mom and pop shop you're eying as a partner for your local gig might never have considered the possibility. You might have to sell the entire idea to them - what you're seeking, what you're offering, and why it would be good for you both. Be prepared to take the lead and convince them that sponsorship is a winning idea--show them the road map to making it happen. Venues can be a great source of information- in fact, the booker at the venue might have a standing relationship with sponsors, such as an alcoholic beverage company they can contact on your behalf to sponsor an open bar for your gig in exchange for some branding. Agents and promoters are also excellent info sources. Look at arena tours of major artists. There is almost always a big league sponsor on board. You might not land that same sponsor for your small club tour, but the companies you see attached to larger tours provide clues for your to follow. Check out their websites - you'll almost certainly find information about applying for sponsorship, including the requirements. You may find that the company is willing to sponsor smaller scale shows. Companies accustomed to music sponsorship sometimes run contests that award smaller acts with big money sponsorship. Take some time to get to know the usual suspects and keep them on your radar. Sponsorship almost always comes at some kind of cost, but is the price tag worth it? Knowing your audience is critical to making your music career work, and sponsorship is an excellent case in point. What will your fans allow? A beer sponsorship might turn off some fans of your Christian rock band while your megastore sponsorship might send the indie kids running for the hills. Think carefully about companies with clear political and religious affiliations, and remember that alcohol and tobacco can be controversial to some groups. You're linking your name to this sponsor, so make sure that you're building a relationship that you and your fans are comfortable with. Money is ALWAYS an issue in the music industry. Learn more about how you can manage your cash with info about funding sources, preparing funding applications and business plans, and how to spend the money once you do get it. Responding to all requests for information from your sponsor promptly. Staying on top of the planning process (if you have a manager, this is a job for him). Make sure the plan is progressing and stay connected with your sponsor so all of their materials are on track for on-time delivery. Ensuring that all advertising, marketing and signage adheres to the sponsorship deal.